Once the first two feet of wall has been packed with clay/fibre mixture, the next two feet of interior forms are attached to the wall framing. As each lower level of wall hardens, the interior forms are “leap frogged” up the wall to create the upper form work. This system not only ensures that each layer is packed properly, it also reduces the amount of plywood sheeting needed. 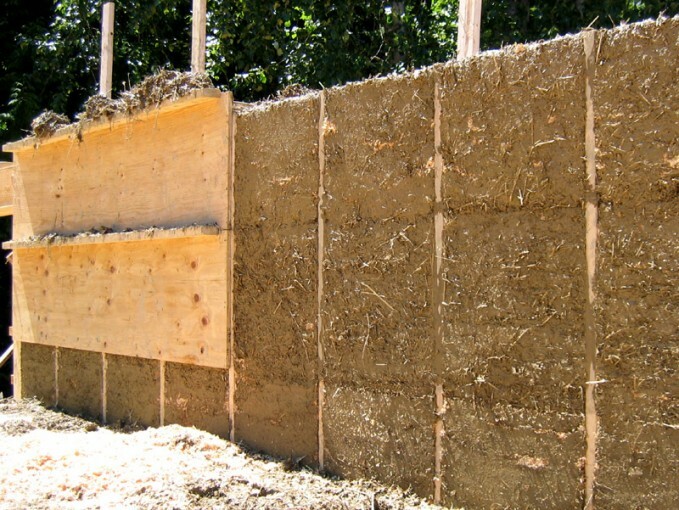 After the wall is packed and has hardened sufficiently to allow for all of the plywood sheeting to be removed, the plywood is reused for future buildings. One of the beautiful attributes of natural building is the reduction of building material waste. In conventional building practices, houses are designed according to aesthetics and function, but without much consideration to the waste generated by walls and roofs that don’t exactly match the standard manufactured sizes of building materials. So any cut off pieces of plywood, batt insulation, metal sheet roofing, and so on, end up in the land fill. Extra building materials left over from natural building systems can either be safely returned to the earth from which they came, or they can be added to your compost pile or garden.